Over the last ten years, circumstances surrounding nature-friendly materials have changed not only in research fields, but also in practical fields all over the world. Biomass conversion is one of the major scientific projects. In order to develop the utilization of residual bioresources, the authors’ research strategy is as follows: (1) renewable plant resources are used as starting material for the preparation of industrial products; (2) industrial residues of plant resources are utilized as they are, without further modification, as starting materials while taking into consideration cost performance; (3) a certain amount of contaminants is accepted, as long as it does not disturb the chemical reaction or characteristic properties of products; (4) however, necessary pre-treatments such as dehydration are carried out in order to proceed with the chemical reaction; (5) the physical properties of obtained products are similar or better than those derived from petroleum and currently sold on the market; and 6) considering practical application, the processing facilities used in the present stage of production can be used without any modification. Based on the above principles, this book describes the results of work on green polyurethanes derived from residual materials obtained from small and large scale industries over a wide area, including Costa Rica, Colombia, Indonesia, Japan, Malaysia, New Zealand, Russia, Sweden, the UK and the USA. In Chapter One, the general background for conversion of plant residues to useful green polymers is introduced. 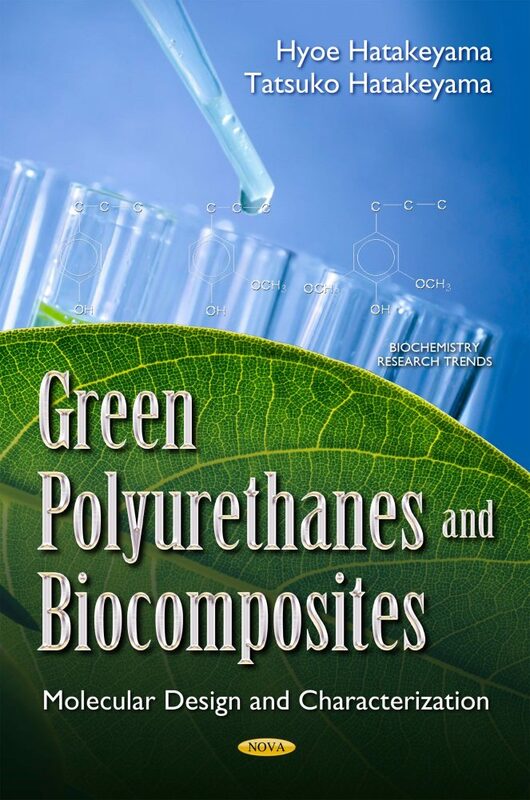 In Chapter Two, preparation methods of polyurethanes and biocomposites derived from plant resources, such as lignin, molasses, plant oil and glycerol are described. The focus is on the detailed procedure of synthesis and processing of bio-polyurethane and biocomposites in laboratory scale with a traceable note of chemical compounds and experimental conditions. To target practical applications, cost performance is also taken into consideration in the above preparation conditions. In Chapter Three, characterization of physical properties, such as thermal, mechanical and spectroscopic properties of polyurethanes and biocomposites using analytical apparatuses found in standard laboratories, is described. Characteristic features of plant components, which affect the molecular relaxation phenomena are mentioned. Long-term properties are predicted based on thermal and mechanical data. In Chapter Four, polyurethanes derived from plant resources such as lignin, molasses, plant oil and glycerol, obtained from various countries are introduced. In Chapter Five, biocomposites filled with various plant materials, such as microcrystalline cellulose, coffee grounds and wood powder are described. Chapter Six presents a brief conclusion. Audience: Researchers of academic institutions and companies developing biomass utilization, scientists in developing countries investigating utilization of a large amount of plant biomass, and graduate student in the field of science and engineering.